Surgent CPA Review [GET $359 OFF] Must Read Before Buying! Surgent CPA Review promises to deliver excellent test results in less study time. This efficient program targets the most important topics on the CPA exam and uses adaptive learning technology to pinpoint students’ weak areas so they can focus on their knowledge gaps. Founder Jack Surgent and expert instructor Liz Kolar lead an experienced and effective team of teachers. Their comprehensive study materials cover all essential topics on the CPA exam without getting bogged down in the details. Surgent takes advantage of the latest technology to help students cut down on study time. The company reports that most clients spend less than 100 hours studying for each part of the exam. 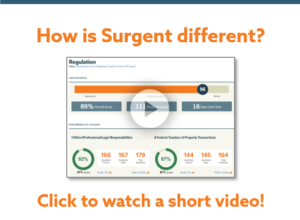 Surgent’s proprietary software determines which areas need more practice and which topics have already been mastered. Surgent’s secret? It’s called ReadySCORE. This program tracks your results as you answer questions and generates a constantly updated score that determines your overall exam readiness. This tool is impressive on its own, but where it really shines is in conjunction with A.S.A.P. technology, which builds custom study sessions for you based on your dynamically updated information. After you’ve answered about a third of the questions in a section, the software selects those questions you should study next and directs you to specific readings and videos. Surgent has brought studying into the 21st century with A.S.A.P. and ReadySCORE. You’ll receive a customized reading list based on questions you have gotten wrong instead of just slogging through hundreds of pages of reading. Surgent takes you right to those readings that will help you ace the questions you previously got incorrect. The course also selects those video lectures that are most closely related to your current area of focus so you’ll know when you should move from one study phase to the next. As a result of ReadySCORE, Surgent students have statistical evidence to endow them with confidence; according to their findings, students with a score of 75 or higher have an 88% chance of passing the CPA exam! Nothing beats studying from the comfort of your own home. Short video lectures by expert instructors, a tailor-made study plan, and progress tracking are just a few of Surgent’s convenient and effective features for students who want to go at their own pace. Physical textbooks are available but optional, as the course was designed to be used with electronic texts. Lectures are short (around 15 minutes each), making it more likely that you will stay focused and complete your study session goals. Type in the date of your exam, select the days of the week you prefer to study and the software will create a study plan just for you. The online Study Planner calculates the number of hours you will need to study each day in order to complete the entire course before your exam date. The study notes are a great review tool, especially once you get close to the end of the course and your exam date. Add this to the custom readings and relevant videos that are chosen for you based on your performance (as explained above), and you’ll see how Surgent truly personalizes its course for each client. Course founder Jack Surgent, CPA, and award-winning professor Liz Kolar, MBA, CPA, CGMA lead a team of experienced CPA instructors, who do a great job of breaking down the more complex material into bite-sized chunks in their short videos. With Ultimate courses, you get a Dedicated Coach who offers you personalized guidance along your studying journey. The engaging presentations help you grasp the concepts so that you can apply your knowledge effectively when you get to the practice questions. Former students praise Surgent’s instructors for their high level of energy, clear explanations and helpful study hints. Surgent’s staff is also helpful and prompt. If you run into any problems during your studies, Surgent offers support via email. You can email [email protected] with specific questions about the course content and the Surgent editorial group will respond within 24 hours. Just make sure you include your exam section and question’s ID number when emailing so they can be as specific as possible. Get access to 2,200+ flashcards by downloading the Surgent CPA FREE flashcard app from the Google Play or Apple stores. You can easily flip through the cards on your phone or mobile device any time you have a few extra minutes to study. The cards cover the material on all four sections of the CPA exam and include terms with definitions and multiple-choice questions with answers. Surgent boasts an impressive pass rate: 88% for students who have a high ReadySCORE as per Surgent’s suggested course instructions, and a 100% pass rate for students who finish the whole course with a score of 80% or higher. If you fail the CPA exam after studying with Surgent, they will refund the tuition or provide continued access to the program until you pass, so course materials do not expire. Please see their website for details of the pass guarantee. You can sign up for a free 5-day trial or register to attend a live online 30-45 minute demonstration webinar to find out more about Surgent CPA Review. The webinars are typically offered Tuesday, Wednesday or Thursday evenings. You can also sign up for the “Video of the Month” to get a video review of a CPA exam topic including related multiple choice questions and simulations. The free flashcard app is useful, and the course is accessible from most mobile devices, but it would be great if the app included additional practice questions or was better integrated into the course. Surgent CPA Review’s price is high compared to the lower tier CPA review courses, but after applying this EXCLUSIVE Coupon Code, the price is a bargain and lower than courses with similar offerings—the Surgent CPA promo codes are great for saving money on your course! Surgent CPA Review is a solid choice for students with busy schedules who have little time to waste and want an efficient and flexible review program. The adaptive technology saves students hours of study time by identifying problem areas and directing students to relevant video lectures and reading materials. Surgent’s creators don’t think students have to read every single page or watch every lecture in order to pass if they work on their weak areas and follow the study suggestions. Their priority is happy customers who pass each section of the CPA exam on the first try. I highly recommend this course for its time-saving efficiency and the unlimited access until you pass. Why not check out the 3-day free trial today? Or sign up for their webinar to see if Surgent CPA Review is right for you! Go To Surgent CPA Review! Includes: 7,250 multiple-choice questions and nearly 400 task-based simulations, including previously released AICPA CPA Exam questions with detailed explanations, 350+ short video lectures, customized study notes for each lecture, free flashcard app, adaptive learning technology (A.S.A.P. and ReadySCORE), audio course content, CPA Exam Success Coach study sessions, integrated test bank, ultimate customer support, and unlimited course access until you pass. Includes: 7,250+ multiple-choice questions and 390 task-based simulations, including previously released AICPA CPA Exam questions with detailed explanations, 350+ short video lectures, customized study notes for each lecture, free flashcard app, and unlimited course access until you pass. Includes: Relevant multiple-choice questions and task-based simulations, videos, and study notes relevant to each section of the exam.